On one side is a United Auto Workers bargaining team that wants a pay bump for veteran assembly workers, who have been paid $28 an hour for almost a decade, as well as a better deal for the lower-paid, entry-level employees who make up almost half of FCA’s workforce. On the other side is Chief Executive Officer Sergio Marchionne, who in April said his company needs a merger partner just to be competitive in the next decade. While the union would prefer to get rid of the lower-paid second class of workers and elevate everyone who works on the assembly line to the top tier, Marchionne would like to phase out the old guard and staff his plants with younger, cheaper labor, said a person familiar with the matter. He’s said that with profit-sharing bonuses, union members’ total pay in the best years could be as high as the first tier gets now. But union workers are skeptical, and there seems to be a greater discontent at FCA compared to other automakers, labor experts say. 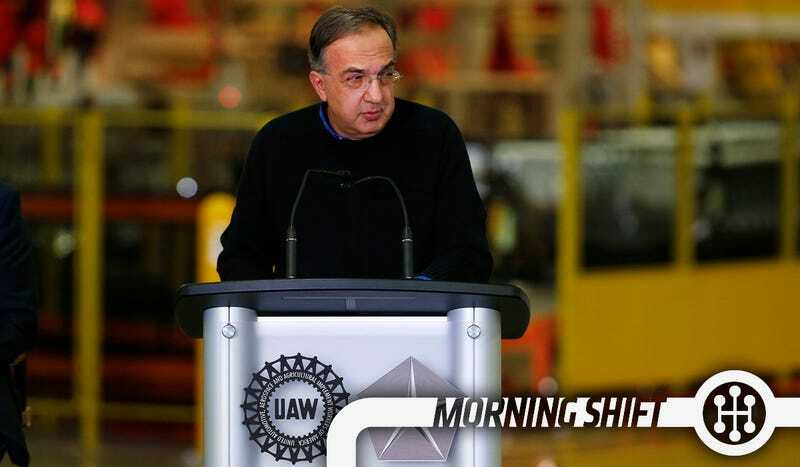 If they see their UAW peers receiving bigger profit-sharing bonuses, the FCA employees could vote to strike. That would be a big failure on all ends. First, less than two weeks before talks begin, Ford Motor Co. confirms it will end production of Focus compacts and C-Max hybrids at its Wayne Assembly plant in 2018. Unless and until a new product line is assigned to the union shop in Wayne, the most likely beneficiary will be Ford’s operations in Mexico. In the UAW lexicon, “made in Mexico” remain fighting words. Eight years of retrenchment and reinvestment in Michigan (thanks, in part, to massive tax incentives extended in the waning days of the Granholm administration) look to be imperiled by a) the de facto end to the the state incentives and b) the press to more closely align profit margins with labor costs. GM sweetened profit-sharing checks earlier this year; continues to announce reinvestments in U.S. plants; confirmed that the automaker has “no plans” to abandon its small-car project at its Lake Orion facility. But wait! There’s going to be drama with GM’s UAW negotiations too. Detroit’s other paper, the Free Press, discusses how negotiations the two-tier wage system — the one that leaves veteran workers with higher wages and newer ones with not-so-great ones — will be far from easy. This year, the union wants to win wage increases for autoworkers after years of rising sales and profits among U.S. automakers while the manufacturers will want to hold down labor costs so they can remain competitive with Asian and German rivals. Those opposing goals potentially puts the union and the companies on a collision course despite a desire by both sides to solve their differences. UAW President Dennis Williams noted that entry-level workers hired under a two-tier wage structure adopted in 2007 do not earn enough to be considered “middle class in the way they should be,” and reiterated the UAW’s goal to close the pay gap with those hired before 2007. For those hired after 2007 (the Tier 2 workers), the 2011 contract lifted their hourly pay from $15.78 to $19.28. Those hired before 2007 are still making $28.50 if they work on the line, and about $33 if they are in skilled trade jobs such as electricians, pipe fitters or carpenters. On all three fronts (or 2.5 fronts, I guess) this will be interesting to watch. The Type R speaks both to Hachigo’s personal predilections and professional plans. Regarding the latter, he aims to revive Honda’s reputation as a purveyor of innovative engineering, stylish fun and cutting-edge cool. “I joined Honda because I loved cars and driving,” Hachigo said. He counts the upcoming Type R, along with the just-released Japan-market S660, an open-top turbocharged mini roadster, as the two Honda nameplates he’s most excited about. That’s my kinda auto exec right there. On Monday, Brilliance China Automotive Holdings Ltd., a partner of BMW AG, forecast a 40% drop in profit for the first half of this year as its joint venture with the German luxury-car maker contended with higher selling costs. Also, shares of Great Wall Motor Co., a mainland maker of crossover vehicles, plunged 13% on Monday after its Friday announcement of a share offering valued at $2.7 billion to fund increased production. Brilliance’s Hong Kong-listed shares were down 7.4% around midday Tuesday, after dropping 0.7% Monday. That compared with a 0.3% decline in the broader market around midday Tuesday. Great Wall shares were down 2.9% in Hong Kong. Raymond Loewy, the hugely influential industrial designer who put his mark on the American automobile industry with groundbreaking vehicles such as the Studebaker Champion, Starliner and Avanti, dies on this day in 1986 at his home in Monte Carlo at the age of 92. Neutral: Who Will Win In The Contract Negotiations? How will this go for everyone involved?